The Publication Unit at the ESNCM is engaged in publishing new books that will help students, teachers and musicians in Palestine and in the Arab World study and enjoy music. Professional musicians compile and edit books on various subjects ranging from teaching methods to collections of (Palestinian/Arabic) music literature. These books are available at various bookshops throughout Palestine and in the ESNCM's five branches in Jerusalem, Ramallah, Bethlehem, Nablus and Gaza. The first method in the Arabic language for the teaching of applied music theory to children. This method includes basic and intermediate principles of music theory, extensive practice in ear-training skills, such as sight reading and singing, basic and complex rhythmic reading, music dictation, and musical analysis, as well as exercises to strengthen the students’ own creativity. Grounded mostly in the Western Classical tradition, the last two volumes also offer a brief introduction to principles of Palestinian/Arabic music and a focus on related ear-training aspects including the use of quarter tones. 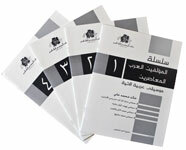 Designed for the ESNCM, this method consists of a series of five books to cover the required courses in music theory. The series was authored by Dr. Adriana Ponce, Habib Shihadeh and Hania Soudah Sabbara. Sharqiyat is an anthology of oriental music pieces mostly transcribed from original recordings and categorized according to the technical difficulty of the pieces. These pieces are categorized for the eight examination levels at the ESNCM plus a preparatory level. This classified anthology is published as a series of four books which are used by ESNCM students for their examinations, and are of great interest to Arabic and oriental music lovers and researchers. The pieces are transcribed and edited by Ahmad Al Khatib. Let’s Play (Haya Na’zef) - 40 Arabic Melodies for the Piano - is a book of popular Arabic tunes and songs arranged for the piano for the beginning levels. The book, arranged by Dia’ Rishmawi, serves as a tool to introduce the piano to young piano students in a culture friendly manner. The book includes colored illustrations representing the themes of the songs. A collections of Arabic songs that ESNCM considers essential for music education in Arab schools. They are chosen for their cultural and musical value from traditional, national and contemporary popular genres. Arranged according to graded class levels, and provided with an analyses of the maqams and rhythmic motives, the book with the accompanying CD is an invaluable reference for music teachers in the Arab world as a whole. It is collected, annotated, edited and presented by Issa Boulos, himself an oud player, composer and musicologist, with assistance from Bettina Ezbidi, cellist and teacher at the ESNCM in Ramallah. A series of instrumental pieces by contemporary Arab musicians, notated and edited by Ahmad Khatib, and supervised by Suhail Khoury. Composers represented in the series are: Ahmad Al Khatib, Charbel Rouhana, Khaled Muhammad Ali, Saed Sharibi and Issa Boulos. This publication is the first volume in a series featuring works by Palestinian composers, and includes 12 pieces by the Palestinian composer and physics teacher at Birzeit University, Ramzi Rihan. Among them is “Contrasts”, a work from the 1950s with which Ramzi won a scholarship to the Los Angeles Conservatory composition program. Songs of Freedom and Hope by Rima Nasir Tarazi: Eight volumes of songs set to lyrics by Kamal Nasir, Mahmoud Darwish, Ibrahim and Fadwa Touqan, Samih Al-Qasim, Omar Abu Risheh, Abu Al-Qasim Al-Shabi, and the composer herself. Each volume comes in two versions: one for the pianist, the other for the vocalists, the latter with notes printed right-to-left to better fit the Arabic lyrics. While the songs have been performed in the past on numerous occasion under Rima Tarazi’s direction and with her improvising on the piano, ESNCM hopes that with this edition more choirs can enjoy performing these melodies, keeping alive the spirit of resistance, commemorating heroes, remembering loved ones, and celebrating the beauty of Palestine. English supplement available upon request. Doors and Keys of Oriental Rhythm by Youssef Hbeisch: Two volumes of explanations, exercises, and rhythm compositions to teach oriental percussion. This publication also provides material for the ESNCM exams, ranging from preparatory level to level eight. In its systematic presentation this work is unique and a valuable contribution to the teaching of oriental rhythm instruments in any setting. With its clear descriptions of notation and execution, this work is ideally suited also for self study. Al-Sununu: Two volumes of Palestinian and Arabic songs, published in cooperation with the Rostropovitch-Vishnevskaya Foundation for a series of concerts performed simultaneously in the occupied West Bank, Gaza, villages in 1948 Palestine, Jordan, and refugee camps in Lebanon and Syria. The songs are presented in a way which is accessible to children. This publication comprises excerpts from the conservatory’s publication Aghanina, where the presentation is more academic with background information and instrumental accompaniment. Amin Nasser-Selected Compositions for Piano: to provide contemporary material for advanced level examinations at the ESNCM, these pieces were chosen from Palestinian composer Amin Nasser’s prolific output. Some pieces were chosen from an anthology published by the composer in 1999, while others, selected from more recent compositions, are unpublished so far. Electronic copies available upon request. Salvador Arnita: As part of the centennial celebrations of Arnita’s birthday, the conservatory has embarked on the publication of the entire output of this Palestinian composer, performer and music educator. While some may still remember him playing the carillon of Jerusalem in the 1940s, its chimes ringing all over the city, his compositions include this instrument in the Antiphony. The compositions published so far are for solo instruments and chamber groups, as well as for string orchestra with solo instruments and choir.